Have a happy New Year, sweethearts! Enjoy whatever you are doing on this last day of 2015. It was a good year for me with many unexpected turns and I’m very curious for 2016. It is completely crazy how fast the years go by when you get older. Looking back and thinking about 2015 I see a crazy and surprising year. In February I came back home after my internship in Munich feeling kind of small, crushed and exhausted. Working in fashion industry was tough and I truly had to recover. 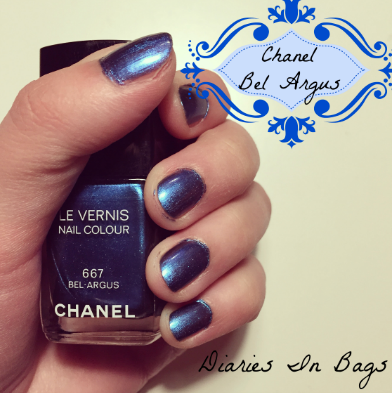 Bel Argus was released in summer 2013 within the L’Eté Papillon de Chanel collection alongside Azuré and Lilis. It is a beautiful metallic blue. I’m wishing all of you a very merry christmas time!